Yes, this happened today! For those of you that know me, or my family you guys KNOW my mom can slay on some potato salad. Like since the dawn of time she's been able to make this, and this was passed on to her from my grandma. 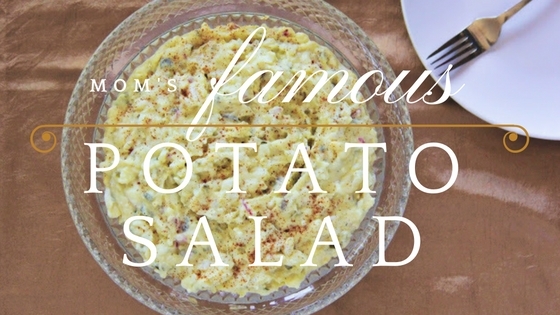 She can literally make this in her sleep, and is known throughout my entire family ( mom & dad's side alike) for her famous potato salad. I was itching for the chance to get it up here and walk you guys through how she makes it, which was also a treat for me because out of the 1000 times she's been in the house making it, I've never sat down and watched her do it. This gave us a good time to bond, & connect and for me to learn how to make the salad myself. In the kitchen when we were making this I asked her how did she learn and her reply was, "Just like you're doing now. I use to sit on the counter and watch my mom make it when I was your age." Oh mom...you sure do warm my heart. :) For my moms FAMOUS potato salad, keep reading! First, you're going to skin all of your potatoes. Once they are all skinned ( we used the whole bag, because we were making a large bowl.) Once all skinned grab a large boiling pot and put your skinned potatoes in the pot. Fill the pot with water. Begin to chop your potatoes while they are in the pot. Continue to chop until all of your potatoes are about 3/4th quartered size (see picture below). Don't worry if the water is dirty, or a little murky, you will rinse off the potatoes before boiling them. Once you've rinsed off the old water, fill the pot back up, with the potatoes still in the pot. Add your eggs to the pot also. When both eggs and potoates are covered with water in the pot. place your boiling pot on medium to high heat for 40 to 45 minutes. Your potaotes should be very soft towards the 45 minute mark. To test this, poke a fork into your potato while it's boiling. If the potatoe slides right off, your potoates are done. Seperate your now boiled eggs into a seperate bowl. Pour the hot potoates into a strainer over the sink. You'll want to drain off any water that was remaining from your pot. Once your potates are well drained, rinse off your eggs, and cool them down. We will peel and chop these later, and add them to the salad. While your eggs are cooling, be sure to chop 1/4th red onion. Set aside. Transfer your boiled potatoes into the serving bowl, begin to gently mash them. Not too much, as you still want some potatoes to still have structure to them. So don't mash them until they turn out like actual mashed potatoes. Mix them around, mash them, but make sure your potatoes still have good texture to them. Add your onions, pickle relish, salt, pepper, sugar, mustard, and mayo. Continue to mix until your ingredients have combined. Peel and chop your eggs, then add into your salad. Again mixing until they are combined. At this point begin to taste your potato salad. You can add more of the ingredients we've already added to bring it to the flavor that you want. Usually at this point my mom adds more mayonnaise, or mustard, and sometimes a little extra sugar to make it a little more sweeter. Mix until all of your ingredients are added, and boom! You've got yourself my moms famous potato salad! This dish can always be paired as a side for dinner, or makes a SUPER easy dish to bring to dinner partiers and/or gatherings. Trust me I know...this is my mom's GO TO dish. She's been doing this since the dawn of time, so it's been tested, tried and true!!! Happy Sunday and cheers to starting off a fabulous week!